The Natural Health Service (NaHS) uses the natural environment to improve the health and wellbeing of individuals and communities across Merseyside and North Cheshire. By bringing together the skills, expertise and assets of our partners, NaHS provides commissioning bodies a single point of access to evidence based ‘products’ that can be purchased as part of a holistic approach to health and social care reducing pressure on NHS and local authority resources in the medium term. To improve mental and physical health and reduce health inequalities by increasing access to and use of the natural environment. To see the Natural Health Service commissioned as part of a holistic approach to health care and improvement. 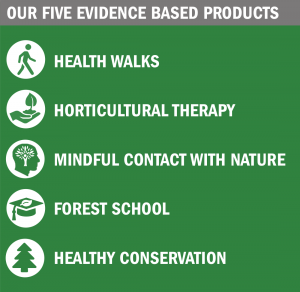 Natural Health Service providers have been working to support people to become healthier and access the outdoor environment for many years. We are now working together in order to provide a commissionable service at scale, working to common standards. Members of the consortium include landowners, delivery organisations, policy and academic partners and strategic partners co-ordinating activity and investing in the long term development of the Natural Health Service. Partners sign up to a clear set of principles, values and a model of governance. Organisations that share our values and mission can join – please get in touch.